The comprehensive set of road improvements in Vint Hill reached a major milestone on April 20 with the opening of a new roundabout at Vint Hill Parkway and Farm Station Road, providing easier and safer access between the community’s northern and southern sections. 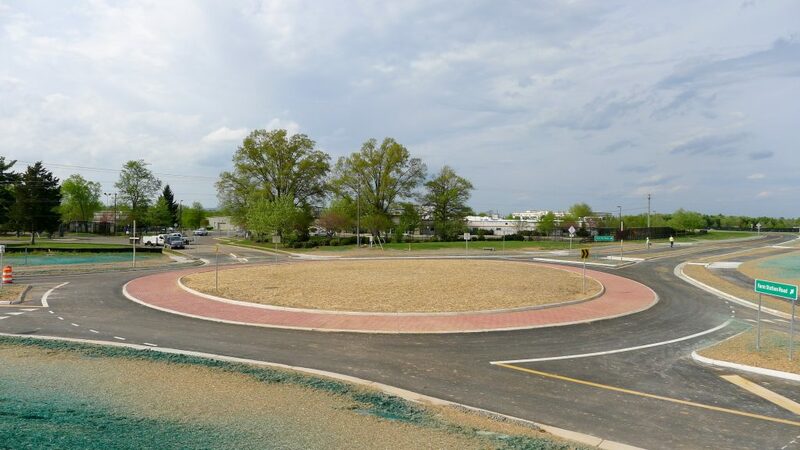 The roundabout is the latest step in an $11 million, multi-phase project, including design, utility relocation, and road construction, that will upgrade roads throughout the property. The project includes the completion of Vint Hill Parkway and Farm Station Rd. (formerly Watson Dr.) plus the complete rehabilitation of Kennedy Rd. and Finch La. within the borders of Vint Hill. The project’s next phase focuses on reconstructing Kennedy Rd. between Aiken Dr. and Burrough Dr. as well as completing Vint Hill Parkway between the roundabout and Kennedy Rd. This part of Kennedy Rd. will be closed for about three months starting April 24. Signs will be posted throughout the property during construction to advise drivers on the best way to navigate around the temporary construction. In addition, the project team has a website with regular updates and graphics that detail the closures and detours. It can be accessed at http://www.vinthillroads.com/. The entire infrastructure project, which is scheduled to be wrapped up by 2018, will greatly improve traffic flow within and around Vint Hill. The upgraded roads will also help stimulate growth at Vint Hill, attracting businesses that will benefit from the improved infrastructure. The improvements also make Vint Hill safer for both vehicles and pedestrians by adding sidewalks, connections to existing trails, and bicycle crossings, and using innovative features such as roundabouts, which research shows improve safety and traffic flow. The entire project is funded by a State Revenue Share Grant, which provides 50% of the funding. and the Vint Hill EDA, which will provide the 50% local match funding. Fauquier County is administering the project and acting as the conduit for the funding. This is the second phase of road construction funded by a 50% state grant and 50% by the Vint Hill EDA. Once this project has been completed, the Vint Hill EDA will have invested over $7 million in road design and construction at Vint Hill over the last five years as part of this program. The Vint Hill EDA in May 2014 sold much of the property it owned at Vint Hill to Vint Hill Village, LLC which is donating the right-of-way for the new and rehabilitated roads.